Forty firefighters completed live fire training this past weekend on ethanol motor fuels. Firefighters from Jackson, Fruitland, East County, Perryville, Whitewater, Millersville, Black River, Cairo, and North County completed a special 12 hour program this past weekend on extinguishing fires involving the newest motor vehicle fuels that contain ethanol. Everyday trains with up to 100 tank cars containing 30,000 gallons of ethanol travel throughout Missouri and 9,000 gallon tank trucks are on Missouri highways. Ethanol, a water soluble ignitable liquid, breaks down the foams that previously were effective on unleaded gasoline fires. In addition, the aggressive nature of ethanol, even on the new foams, requires new application techniques which are stressed in the class. The new University of Missouri Fire and Rescue Training Institute program is for municipal and industrial firefighters, emergency management, medical responders and industrial safety managers. Classmembers are trained on selecting, teaching and using firefighting foam on the new ignitable liquids. The live fire burns are conducted in a primary compartment surrounded by a secondary container to capture any overflow. 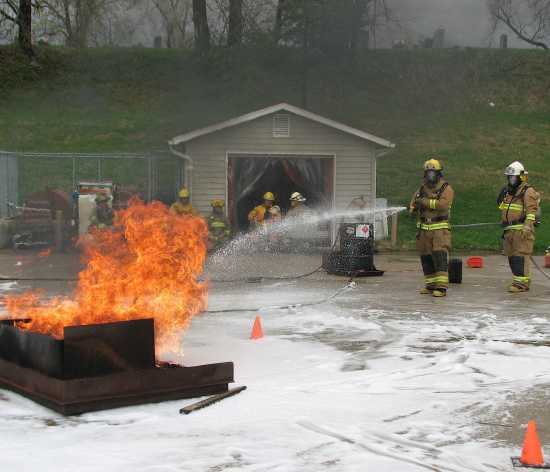 Cooperation between Missouri Fire Training and Missouri DNR resulted in selection of a training fuel that produces virtually no smoke and the non-flammable water bottoms are disposed of at a POTW facility in compliance with MO/DNR environmental regulations. The new class will be offered again in New Madrid on April 10 and 11.